Oh, the path may be the same, all those beckoning hills and curves. It may be the very same exact road your feet trod the last time, heading in the very same direction. That's a fact. It's the person who has changed. When I first walked through the doors at Crestview Elementary School to finish my sixth grade year, the pristine whiteness of the paint was almost luminescent, aglow with promise. The schools seemed to have sprung from the lush sea of grass surrounding it. My brother and I had just arrived from Germany, where snow still clung to the ground and the world was still gray within winter's grip. The sense of imminent spring shocked us, even as my father dropped us off for our first day. I gawked at my new surroundings. The cavernous floor plan was open, and entire room divided by simple partitions into each room instead of walls. The result was a boisterous mix of voices and sounds that somehow seemed alive. The people that I met that year have faded. The place, the whiteness, the openness, the freshness of a new school...that has stuck in my mind. Everything seemed huge. Even the cafeteria was enormous, miles wide. An introverted child walking up to the front of the cafeteria to participate in the school spelling bee had a long time to feel the performance anxiety pulling her feet into the floor. 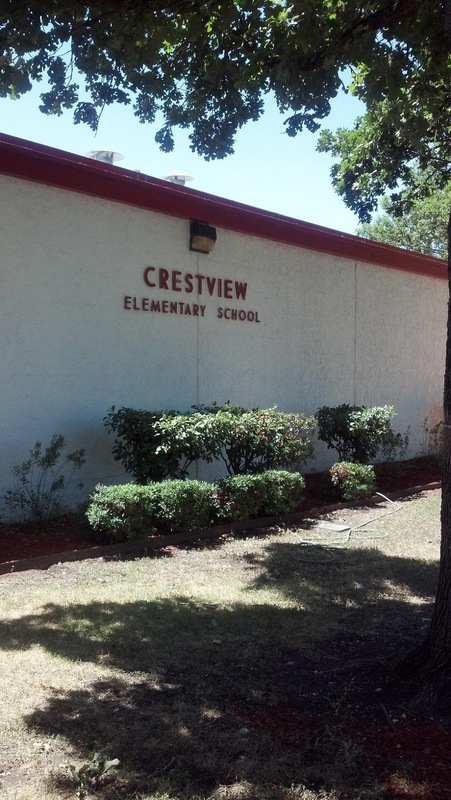 On this day, Crestview Elementary is crowded by houses, and the green sea of grass has been replaced by the asphalt of roads and driveways. The brilliant white paint seemed gray, now shaded by mighty Live Oak trees. As I walk through the doors, the place seems cramped, suffocating. Tiny. The open classroom floor plan, which research determined to be a completely horrible idea, had disappeared in favor of walls and doors. The hallways seemed almost claustrophobic, and the ceiling pushed down on the top of my head. And the cavernous cafeteria, once so very impossibly large, seemed almost too small to hold all the tables and the teachers who now sat there. A sadness came over me, sitting at a table and listening to the presenters. For while I held that memory of a brand new elementary school in my head all those years, I felt as though I could briefly turn back the clock, and go back. And as long as I did not seek that memory's origin, located so close, I could fool myself. I could clutch that memory to my heart, a talisman. It was a fine memory. And now it is gone. Because you can't go back. Hey! So excited to see you here. Really got that feeling of the long walk for an introvert...yikes! nope you really can't. some things are just best left as a memory. Memories are perfect until we compare them with reality. Yes! This! I'm almost phobic about going back to the places where I've got really strong memories. I don't want to give the present an opportunity to tarnish them. Our perception and reality changes as we age. Things are never how we remember them. The schools where I went to my early grades, and the same ones my father went to, are now gone. Replaced by new schools that are sort of old in their own right. I was trying to describe them to my kid the other day and memories of that time came pouring back. But you're right, I can't go back. Especially since those places don't even exist anymore. I think everyone should avoid ever going back to their elementary school. Everything always seems so much more diminutive than in our memories, not only because we ourselves were smaller back then, but because our mind enlarges those memories over the years until they are bigger than life. Reality always crashes down upon us if we try to revisit. Very well written. It's really weird, but my friend's son is going to what was my elementary school. The school was renovated and got a total face lift, but there is one side and door that they didn't change, and it was the door we waited outside of for school to start. I loved that the one detail never changed.